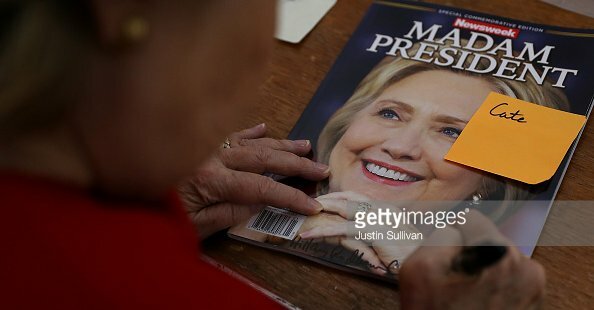 Arrogant Hillary Clinton signs a copy of Newsweek’s “Madam President” before she lost bigley to Donald Trump. Liberal Newsweek recalled 125,000 collector’s edition copy of their “Madam President” Hillary cover. The Trump Newsweek edition is not available until next week. They didn’t think Trump would win. They trusted the liberal polls. Everyone from pollsters to pundits got the result of the US presidential election wrong. But few can have made it in such an expensive manner. Newsweek and a partner that prints up special commemorative issues has been forced into an embarrassing recall, after it sent out 125,000 copies of its Madam President issue designed to celebrate Hillary Clinton’s win. Although Topix Media had also prepared a Donald Trump version it thought it was safe to dispatch only the version detailing “Hillary Clinton’s historic journey to the White House”, as the cover put it. “Like everybody else, we got it wrong,” Tony Romando, chief executive of Topix Media, told The New York Post. The edition appeared on shelves on Tuesday but was hastily withdrawn. Newsweek had two covers but chose to print only the Hillary cover because they were so confident in her win. This cost the company thousands. What a bigly mistake.